The $27 million facility located at the corner of Jenkins Avenue and David L. Boren Boulevard, just north of Highway 9, is named in honor of the Stephensons in recognition of their $6 million lead gift for its construction. Charles Stephenson is chairman, president and CEO of Vintage Petroleum, which merged with Occidental Petroleum during the first quarter of 2006. Comprising nearly 95,000 square feet of both private and communal laboratory, office and general gathering space, the two-story building is configured to support rapidly changing research programs and new collaborative initiatives in biosciences, bioengineering, robotics and supercomputing. 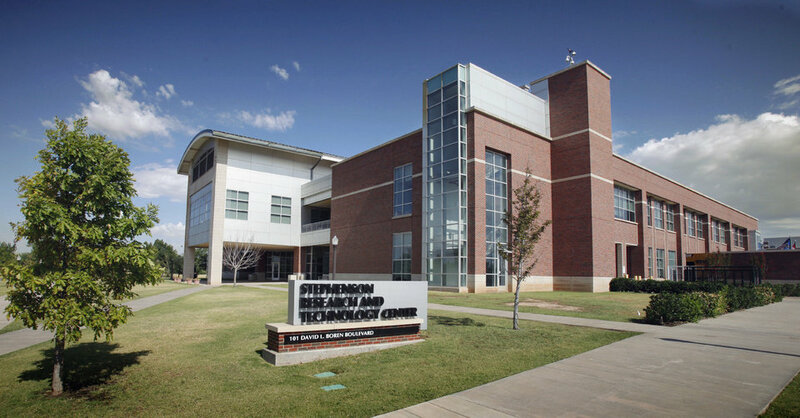 OU faculty began moving into the Stephenson Center in spring 2004. The idea behind the facility was to avoid a series of individual offices and laboratories with hard walls and doors in favor of an open environment. The design gives identity to individual research groups but also provides great flexibility and stimulates cross-disciplinary interactions. The facility's layout and accoutrements are both functional and aesthetically pleasing. On the first level, laboratories, workspaces and conference rooms surround an expanse of open, airy, atrium-like space. The furnishings - from contemporary hardwood chairs surrounding laminate-covered tables to upholstered chairs in clusters - around enhance an environment that is at the same time vibrant and tranquil.